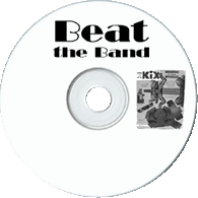 A war-time radio musical-quiz program, the first season of Beat the Band was sponsored by that ready-to-eat corn cereal, Kix and hosted by Gary Moore. Radio listeners sent in music title questions such as "What song title tells you what Cinderella might have said if she awoke one morning and found that her foot had grown too large for the glass slipper? Band members then had to figure out the riddle and play the song (the answer is "Where Oh Where Has My Little Dog Gone?). Listeners received $10 per question that was used on the air. If they could stump the musician, i.e. "Beat the Band, they received $20 and a box of Kix. Musicians who missed the answer had to "feed the kitty, meaning they had to toss half-dollars onto the bass drum (something audience members loved to hear). The musician who scored the most points then got to take home the kitty.The second season of Beat the Band came during the war years and was hosted by "The Incomparable Hildegarde." It began as a summer replacement for The Red Skelton Show, but ended up lasting over a year. 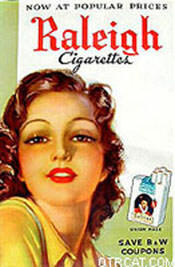 Sponsored by Raleigh Cigarettes, the format was the same except that radio listeners won $25 and a pack of Raleighs for beating the band. Also, instead of "feeding the kitty with half-dollars, musicians tossed packs of Raleighs on the bass drum to be sent to soldiers overseas. 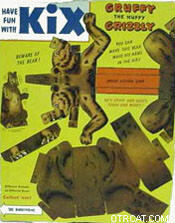 For more rare quiz programs, see also:Rare Game Show Collection. See also: Stop the Music. Happy birthday to O T R C! Thanks for being there all these years! My only regret -- I wish I had found you 17 years ago. lol Keep doing what you're doing. We love it. You're the best! More orders coming soon I promise. Say hi to your kitty. Take care and make it a great year! An OTRC FAN fan for life. Up to now, I had only heard a few isolated broadcasts. Now to have it as a series with a very young Gary Moore as host, and Ted Weems band with an even younger Perry Como as vocalist is a nostalgic treat.If you are a thirties/mid forties music buff, or love the "liveness"of classic Radio, this is for you.